* Process all your papers. Do you hate carrying around 27 receipts, a handful of lists plus the paperwork for the errands you're running? Instead, carry a small accordion folder that you can easily file everything away in. This will keep your papers neat and prevent them from getting crumpled, plus you'll know exactly where to look to find the ones you need. * Utilize pockets. You've got them, flaunt them! 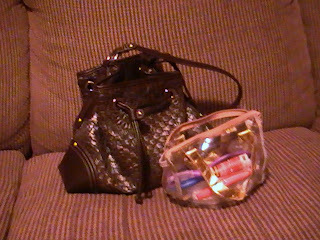 The quickest way to organize your purse is to make use of every little space it was designed with. Figure out what works best and where, and then always return that particular item to that spot. This will make the larger areas more organized and you'll save tons of space. * Don't try to carry it all. There is a limit to what your back and shoulders can handle, so don't try to carry everything you own in your pocketbook. The essentials like your wallet, a calendar, coupon organizer and a small amount of make up are fine. Year-old receipts, old candy and broken pencils are not.